This is a Vishnu Mantra to remove misery. 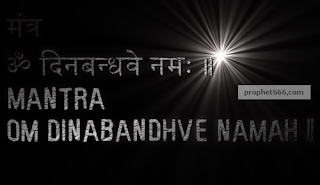 The meaning of the Vishnu Mantra is – “I pray to the Vishnu; the one who helps the miserable”. The meaning of Dinabandhu; the word immortalized by Mahatma Gandhi is – “the companion of the poor”. The word poor in the context of this mantra has to be taken for the misery and the miserable people of the society. When one senses that there is no hope in life and mere existence has become hopeless, then leave it to Vishnu to show you the way out from the long dark tunnel of life. The mantra; a meditation upon Vishnu, bears fruit after the chanting has reached the 800,000 chants mark. The Vishnu Mantra is suitable for all those persons who are miserable for a variety of different reasons; including poverty, unemployment, death of a loved one, failed marriage or love affair and diseases and illness.